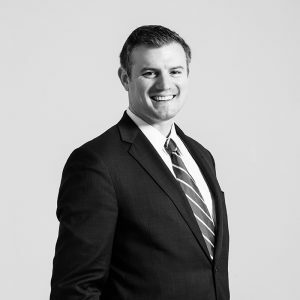 Ben Shrader focuses his litigation practice on complex matters in state and federal court, spending a significant amount of time representing parties in mass torts, class action cases, and single-plaintiff litigation. He has defended clients ranging from global companies to small businesses to individuals, in civil matters including personal injury, premises liability, and commercial cases. As a member of national coordinating counsel teams for multiple Fortune 500 companies, he has supervised and managed the defense of asbestos litigation matters in jurisdictions across the United States. Additionally, Ben serves as Illinois and Indiana local counsel for toxic tort and mass tort clients. Ben also maintains an active sports and entertainment law practice. Recently, he was part of a team that obtained a favorable settlement on behalf of a class of retired American Basketball Association players in an ERISA case. Currently, he represents numerous retired ABA and NBA players in individual pension disputes and handles concussion litigation claims on behalf of retired NFL players. A former professional sportscaster, Ben has provided counsel and advisory services to on-air talent from coast to coast. He also represents journalists and members of the media in defamation and free speech cases, stemming from activity in both traditional and online media. Ben was selected for inclusion in the 2017 edition of Super Lawyers' Illinois Rising Stars list. No more than 2.5% of lawyers under the age of 40 in the state of Illinois are selected for this honor. During law school, Ben served as symposium editor of the DePaul Law Review, which has also published his work. During law school, Ben interned in the United States Attorney's Office for the Northern District of Illinois. Using an Illinois Rule 711 senior law student license, he represented the United States government in federal court, successfully prosecuting petty offenders. He also served an internship in the chambers of Judge William Maddux, then the Presiding Judge of Cook County's Law Division. Ben maintains an active pro bono practice, and in May of 2013, he was honored by the Circuit Court of Cook County, the Chicago Bar Association, and the Chicago Bar Foundation for his commitment to pro bono work, stemming from his defense of low income litigants in Cook County's First Municipal District. Ben lives in Chicago with his wife, Anna.